This week marks the end of the sixth full year of this column, a busy one for Cape Region golf. January—Cape Region golf superintendents describe wintertime projects, including irrigation improvements at Cripple Creek Country Club, a new comfort station at The Rookery, and drainage work at Sussex Pines Country Club. Several golfers play in a winter golf simulator league at Clubhouse Golf. The USGA and the Royal & Ancient adopt new changes to the Rules of Golf. February—Phil and Joan Voshell of Rehoboth are excited about their new business venture, Voshell Golf Cruises. Cape Region country clubs invite new memberships on tempting terms. Pete McCaffrey of Clubhouse Golf discusses the 2004 models in clubs and balls. March—Among the “other rules” of golf: Nonchalant putts count just as much as chalant putts. Kings Creek Country Club announces a new par-3 hole to be built this year. Corey Groll, Cape Henlopen High’s new golf coach, and his assistant, Dusty Shockley, talk about their goals for this year’s team. The Vikings fight the cold and wind while losing their first match of the season to Caesar Rodney. April–Claudio Smarrelli, Cape’s JV volunteer coach, shows his young charges how it’s done with a hole-in-one during a practice round at The Rookery. The varsity bounces back with a win over Delmar. The Vikings keep on winning, beating Indian River and Lake Forest, and then squeeze by Milford by 2 strokes. They finish the month’s matches with even more wins, over Seaford, Smyrna, and Sussex Central. My spring golf trip includes a stop at Bald Head Island and several courses in the southern strand at Myrtle Beach. May—Cape’s golf team rises in the state rankings as it continues winning. They slip past Sussex Tech by two strokes, and then easily handle Polytech. They cap their season by beating Dover, and then take both the Henlopen North and Conference Championships. Several players also play well in the individual Conference Tournament. Julia Robinson wins her first International Junior Golf Tour event. June—The Vikings earn fifth place overall in the State Championship, best among downstate teams, with John Purple earning third-place honors. Nearly 75 junior golfers come to Rehoboth Beach Country Club for the annual Junior Open. Former Cape standout Christina Wagamon wins her flight in the Delaware Women’s Amateur. July—Scot Anderson is the first golf course superintendent at Old Landing Golf Course. Tom Metz celebrates his first hole-in-one, at the famed Pine Valley course in New Jersey. Not to be outdone, 85-year-old Dr. Jim Beebe shoots his second hole-in-one, at Rehoboth Beach CC. 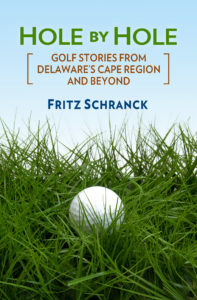 Pete Oakley’s win in the 2004 Senior British Open thrills his family and Cape Region friends. August—Baywood Greens’ fabulous new clubhouse opens to rave reviews. Pete Oakley visits with a crowd of well-wishers at a Rookery reception in his honor. Bob and Wendy Stenger celebrate the first anniversary of their new par-3 golf course at Shamrock, near Milton. September—Cyclonic Golf, the Lewes golf shoe company, branches out into clothing. Mike Connor, the assistant golf pro at The Rookery, sits still long enough for a Cape Region Pro-file. Shawnee CC’s golf league is a season-long outing that’s a lot of fun for the players. October—George Washington University hosts and wins its Rehoboth Beach Invitational college golf tournament at Kings Creek CC. Jay Reed shoots his first hole-in-one, during Shawnee’s Club Championship. I play with Shawnee’s Ball Tossers, and then beat myself silly at Bulle Rock, the beautiful, challenging course near Havre de Grace. November—I prove that trees are 90% wood, and only 10% air. Cape Region greens superintendents discuss their winter projects, including new drainage, new trees, and new bunkers. December—I’ll never run out of suggestions for golf gifts that should not be bought. On the other hand, local pros and golf shops have better ideas for Christmas.